Hola to all Android buddies out there! 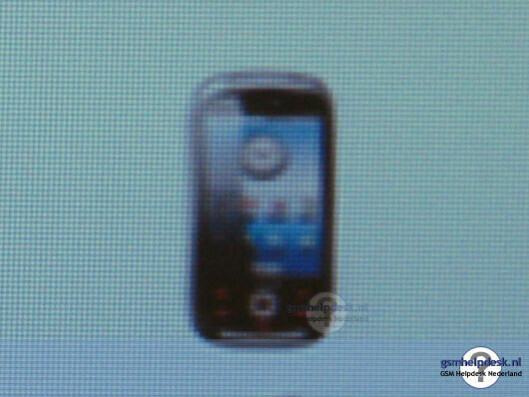 The first unofficial image of Samsung’s upcoming Android device has hit the streets. The picture has been taken at a presentation made at a dealer event in Amsterdam. The phone seems to sport the candybar form-factor, but there is always a chance that a super-handy side-sliding QWERTY keyboard may be hiding behind what we see on this “incredibly crisp and clear” image. The touch screen of the future device is said to incorporate the capacitive technology, which will allow for multi-touch functionality. According to the source, the handset will be powered by a 528MHz processor and will probably utilize a 3.2 or a 5-megapixel camera, microSD card slot and Bluetooth 2.0 with A2DP support. Google Maps with Street View and Latitude will also be on board. It is expected that there will be two versions of the phone: one designed to work with U.S. 3G networks and another with Europen/Asian 3G but… when? For how much? These are questions that do not lead anywhere for now. i wonder if this will go to Verizon? I just hope its CDMA, then it doesnt matter who.